Proposals to fingerprint children aged 11 to 15 as part of new passport and ID card plans are being considered. Immigration minister Liam Byrne told ITV1's The Sunday Edition the proposals were being "looked at". Under existing plans every passport applicant over 16 will have details - including fingerprints - added to a National Identity register from 2008. But there was concern youngsters could use passports without biometric details up to the age of 20, said Mr Byrne. This could happen if they are issued a child passport between the ages of 11 and 15, which would be valid for five years. Both the Conservative and Liberal Democrat parties called the idea "sinister". 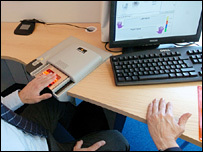 Officials at the Identity and Passport Service (IPS) had proposed the fingerprint database, said Mr Byrne. But he added that no final decision had yet been made on whether to go ahead with the idea. "The challenge that officials have been asked to find an answer to, is how do you make sure that people who are 16 and over have got biometric details recorded in their passports?" he told the programme. Shadow home secretary David Davis said the proposal "borders on the sinister" and added it showed the government was trying to end the presumption of innocence. "This government is clearly determined to enforce major changes in the relationship between the citizen and the state in a way never seen before." "The determination to build a surveillance state behind the backs of the British people is becoming increasingly sinister," said Liberal Democrat home affairs spokesman Nick Clegg said. "It is a measure of ministerial arrogance that plans are being laid to fingerprint children as young as 11 without having a public debate first. "As millions of British citizens discover that they will have to pay through the nose for the privilege of being included in a range of government databases, ministers should not be surprised if public resistance becomes ever more vocal." Last month the opposition parties expressed anger that all fingerprints collected for ID cards would be cross-checked against prints from 900,000 unsolved crimes. And campaigners have long battled fingerprinting of children in schools, a practice they estimate happens in about 3,500 establishments. From this month guidelines from privacy watchdog the Information Commissioner will urge schools to get parental consent before taking biometric data. But under the Data Protection Act schools do not have to seek parental consent, and calls to outlaw the controversial practice have been rejected by the government. On Monday campaign group Leave Them Kids Alone will launch a list of 10 questions it recommends all parents ask of their child's school, if biometric systems are being considered or introduced. Campaigner David Clouter said they feared "normalising" the practice in schools would lessen resistance to pressure for the fingerprinting of younger and younger children. "Whatever the reason, it is an infringement of a person's civil liberties," he said.